According to a 2015 report, India is one of the highest garbage producing countries. Municipal Authorities across the ciuntry dispose approximately 45 million tonnes of garbage in an unhygienic way. And none segregates a majority of this garbage. There must be manual scavenging of dry and wet wastes before sending them for recycling. Manually scavenging through nearly three million trucks worth of garbage is impossible. The solution is encouraging citizens to segregate the waste before disposing it. But, how do you make sure this is done? The Waste Samaritan, an initiative by design students in Bangalore, India has possible solution. 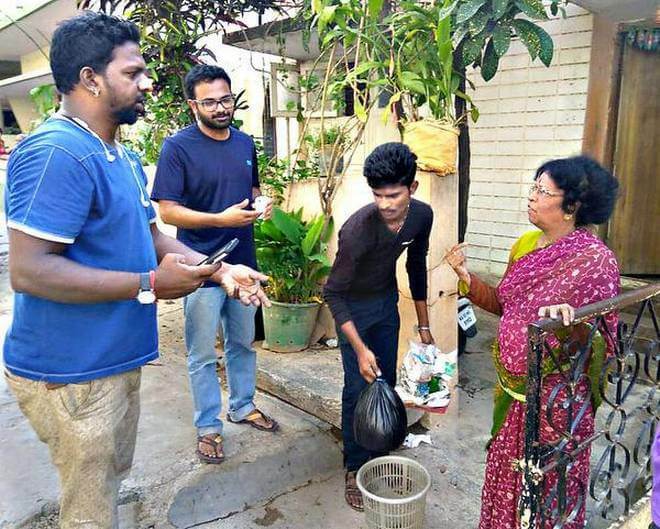 The initiative is a ‘door-to-door waste monitoring system’ that encourages residents to segregate their waste material. The winner of the Reimagine Waste hackathon, the initiative partnered with Bruhat Bengaluru Mahanagara Palike in 2017 for a pilot project. As part of this project, the team monitored 250 households using QR Codes in the Domlur area in the city. Each property was allotted a unique QR Code. Since property was the parameter for allocation of QR Codes, multiple households in a building came under the same QR Code. Thus, a total of 152 QR Codes were allocated to monitor 250 households. The initiative uses the Shuchi Mitra app, developed by the civic body to help pourakarmikas (scavengers), take pictures of the waste and also rate the residents. Within three months of its launch, the initiative achieved 75% high quality segregation out of 152 households monitored. “The Shuchi Mitra app will show precisely how much waste each household generates. The software is ready and once we get all systems in place such as biometric attendance for pourakarmikas and GPS-enabled collection vehicles, we will be able to launch it in a big way.” -Sarfaraz Khan, Joint Commissioner, Solid Waste Management, BBMP. What are your views on the The Waste Samaritan initiative? Share your thoughts in the comments section below.